Altoids launched "Where's Cindy" game where you have to follow clues around Google Earth to locate, well, Cindy. There's no immediately available back story explaining why you should care about her besides the suggestion that she's "super hot", but it's an interesting attempt that highlights the difficulties around creating interactive applications around Google Earth. The gameplay, at least at the early stages that saw, is about showing you a drawing of a location and asking you to type it into the "passport" to download a kml file with the corresponding placemark in Google Earth. The placemarks don't do much besides showing a link back to a different page on the website with a new clue, so there's a lot of switching between the program and your browser as each clue has to be downloaded as a separate kml file. 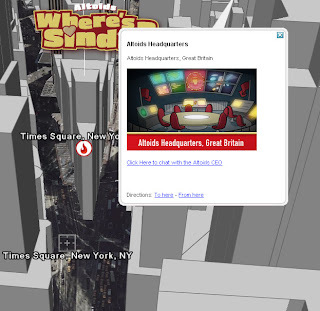 Also, it is not entirely clear why Altoids chose Google Earth over the much more convenient Google Maps.